Different morphological characters of plant impart resistance against major insect pests of cotton. These plant attributes have been used to complement chemical control. This method is also compatible to cultural practices. Studies were initiated during 1973-74 that gave very fruitful results in the form of nectaried and nectariless insect resistant varieties. Screening and evaluation of cotton germplasm for their resistance against major insect pests and ecological studies of bollworm complex in cotton through pheromone baited traps are in progress. Biological control is the most effective method when used with other compatible pest control practices in IPM programme. 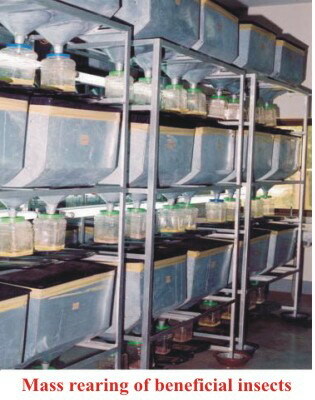 These practices include cultural control, planting insect resistant varieties, sterile insect technique (SIT), male/female annihilation technique through pheromones and using selective insecticides when other practices fail to keep pest numbers below the economic threshold. Biological control is neither hazardous to the human health nor to the environment. There is no chance for the pest to develop resistance against natural enemies that commonly occurs with insecticides. NIAB has started R&D work on mass scale on bio-control management of insect pests of agricultural crops especially those of cotton and sugarcane assisting the farmers by providing them the beneficial insects Trichogramma, Chrysoperla and Bracon for field releases. Although recommended in crisis, chemical control still remains the major method of pest control under field conditions. Efficacy trials of insecticides, especially on new chemistry insecticides are a regular feature at NIAB. The objective is to guide farmers on the most effective options available for the management of major pests of crops. For the last three decades, there has been an extensive use of pesticides for controlling economic pests and hence increasing the productivity of our crops. This led to the development of insecticide resistance in the major crop pests resulting in control failures by insecticides. Insecticide resistance is a genetic phenomenon with serious economic repercussions. A laboratory for Insecticide Resistance Management is being established at NIAB to detect insecticide resistance in major pests, determine its mechanisms and devise insecticide resistance management strategies. One of the major constraints to chickpea production in Pakistan is blight caused by a fungus Ascochyta rabiei. 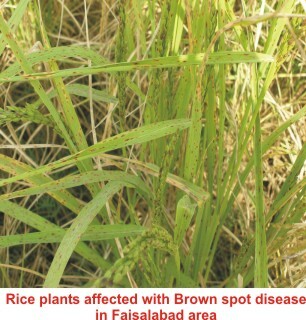 This disease can destroy the crop in days when appears in epidemics under favourable environmental conditions. Disease samples are collected from major chickpea growing areas and research stations. The isolates obtained from this material are studied in order to categorize according to their pathogenicity and are used for screening of germplasm to evaluate resistance potential of host varieties/lines against this disease. Biological pathotyping of isolates using host differential set is conducted for determining their pathogenicity level. Genetic variability of isolates is also being studied through genotyping using molecular marker techniques such as RAPDs. Work on Induced Systemic Resistance in chickpea and rice against diseases by treating the plants with simple chemicals and its biochemistry is in progress. An other important disease of chickpea is wilt which is soil borne and caused by Fusarium oxysporum f.sp. 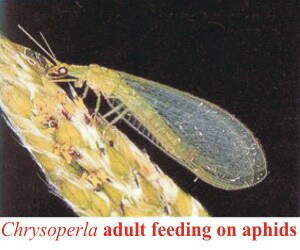 ciceris. Field and lab. screening of varieties against wilt which has almost wiped out chickpea cultivation in irrigated belt of Pakistan is in progress. Viral diseases have spread at an alarming pace in the cultivated crops during the last two decades. These diseases include: cotton leaf curl, tomato leaf curl, shoestring of tomato, sesame leaf curl, sesame phyllody and chickpea stunt disease etc. Other important diseases are bacterial leaf blight (BLB) and brown spot of rice, and quick decline of mango, shisham and citrus. Host Plant Resistance against cotton insect pests. 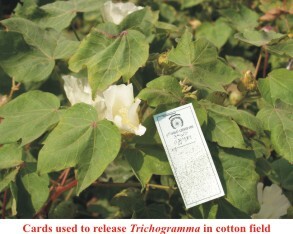 Ecological studies of bollworm complex through pheromone baited traps in cotton. Field testing of new chemistry insecticides for their efficacy against sucking insect. pests and bollworm complex. Biological control of major insect pests of crops, fruits and vegetables. Survey of major chickpea and rice growing areas of Punjab and NWFP for assessment of incidence of various diseases. Isolation, purification and virulence studies of Ascochyta rabiei, Fusarium oxysporum f.sp. ciceris (FOC) and Xanthomonas oryzae oryzae (Xoo) isolates. Screening of promising chickpea germplasm for resistance against blight and Fusarium wilt diseases. Genetic characterization of Ascochyta rabiei, FOC and Xoo isolates using DNA molecular marker techniques. Induction of systemic disease resistance to chickpea and rice against diseases by simple and safe chemicals. Studies on host specificity of toxins, virulence, pathogenicity, effect on host plants and other Biological factors for mechanism of resistance and susceptibility. Screening of cotton, rice, tomato and sesame germplasm against certain biotic and abiotic diseases and disorders under field, screen house and laboratory conditions. Host plant resistance studies have resulted in evolution of three insect pest tolerant varieties of cotton. The first variety NIAB-86 was evolved in 1990. It is nectaried and hairy, tolerant to sucking insect pests with good fibre characters having yield potential upto 6800 kg ha-1. The second variety NIAB-26N was evolved in 1992. It is nectariless hairy with large bolls and attractive opening: relatively resistant to insect pests especially pink bollworm and jassid. Another breakthrough was evolution of NIAB-Karishma variety in 1996. The variety is nectariless and hairy, tolerant to sucking insect pests and bollworms, heat and virus, possesses the best combination of fiber characters i.e. GOT 37.4% staple length 28.6 mm, fineness 4.9 Mv and strength 93 ppsi with the maximum record yield potential upto 7400 kg ha-1. The variety covered 14 to 21 % area under cotton in Punjab. In addition, more than 300 advanced strains and varieties of cotton have been screened and evaluated for their resistance against sucking insect pests and bollworm complex. Field experiments showed that egg parasitoids, Trichogramma spp. and predator, Chrysoperla carnea were very effective and useful for the control of major insect pests of cotton i.e. American, Pink and spotted bollworms and borers and Pyrilla of sugarcane. Large field trials against these pests covering hundreds of acres of different farmers have been conducted. Farmers have reduced the number of insecticide applications and saved the considerable cost of insecticide inputs. 105 insecticides have been tested for their efficacy against sucking insect pest i.e. jassid, whitefly, aphid, thrips and mite, and bollworm complex i.e. American, Spotted, Spiny, Pink and Army bollworm. It has been found that Imidachloprid and Actachloprid gave better results in controlling the sucking insect pests whereas, Emamectin, Indoxcarb, Spinosad and Abamectin are effective against bollworm complex. The application of insecticides by drip irrigation has been compared with conventional spray method to control the insect pests of cotton. The results showed that chemigation with drip irrigation did not provide adequate control of whitefly, jassid and thrips. However, it was successful in controlling termites in cotton. 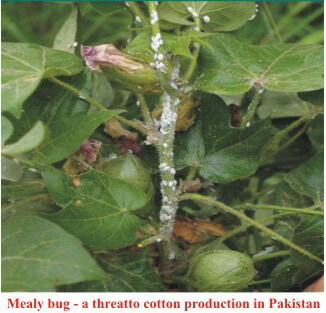 For the management of cotton mealy bug, its susceptibility was assessed to endosulfan, six pyrethroids, five organophosphates, three carbamates and three neonicotinoids using a leaf dip bioassay. Bifenthrin and profenofos exhibited the lowest LC50s, followed by lambdacyhalothrin, deltamethrin, chlorpyrifos, methidathion and carbosulfan. These insecticides were therefore recommended to the farmers through the provincial extension department for the chemical control of cotton mealy bug. Pathogenic and genetic diversity has been established in selected isolates of Ascochyta rabiei collected from different chickpea growing areas of Pakistan through biological pathotyping and genotyping. Based on their aggressiveness, isolates have been classified into various categories such as least aggressive, medium aggressive and highly aggressive isolates and highly virulent isolates. A culture collection of about 200 isolates originating from different chickpea growing areas is being maintained. 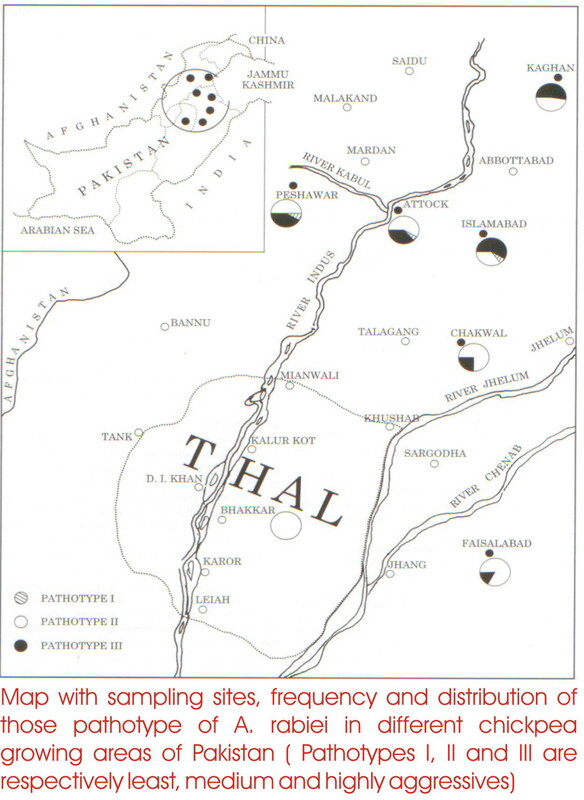 A geographical map of chickpea growing areas of Pakistan has been constructed to mark the prevalence distribution of these isolates, in different chickpea growing areas. The expertise and facilities for screening of chickpea germplasm against blight and wilt diseases in the field and under controlled environment through direct inoculations, using culture filtrates/toxins, electrolytic leakage and water culture method have been developed. Direct bioautography technique for detecting antifungal compounds on TLC (thin layer chorography) plate has established and standardize. Gallic acid, a phenolic compound has been identified as a biochemical marker from chickpea plants resistant to Ascochyta rabiei, which could be used for screening of chickpea germplasm against Ascochyta blight under laboratory conditions. Protection against Fusarium wilt was observed 50-73% with different concentrations of Bion (0.3, 0.4 mM), 47-70% with Salicylic acid (1.0, 1.5mM) and 22- 60% K2HPO4 (30, 50 mM) in different experiments conducted under control environmental conditions. Work on induced systemic resistance (ISR) is being continued with these chemicals and neem leaves extract for final recommendation to farmers. The discolouration of vascular bundles in plants is reported to be directly related to susceptibility to Fusarium oxysporum. However, research work at NIAB showed that quantification of Fusarium oxysporum f.sp. ciceris (FOC) at seedling stage in chickpea is more reliable approach for determining resistance than vascular discolouration. Identified a number of highly resistant mutant lines against cotton leaf curl disease-Multan (CLCuD-Multan) through artificial inoculation (grafting) and by exposing them to high inoculum pressure by planting in natural hotspots. NIAB-999 and NIAB-111, approved cotton varieties are among the germplasm identified as resistant against CLCuD-Multan. However recent graft inoculation studies showed that all the cotton germplasm is susceptible to CLCuD-Burewala. Group is also providing expertise and facilities to the breeders for the screening of cotton germplasm against cotton mosaic, bacterial blight, stunting, and boll rots etc. Indigenous and exotic tomato germplasm (representing more than one hundred varieties), planted in field, tunnel and screen house were observed against certain diseases to generate basic information for setting research priorities in order to develop resistant varieties for the integral disease management programme. 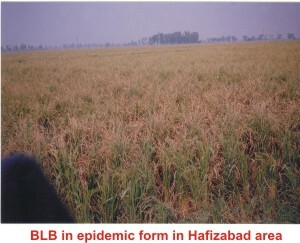 Several biotic and abiotic diseases were found at NIAB. 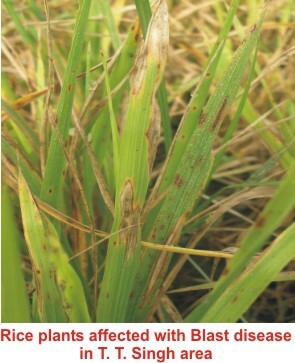 Among biotic diseases early blight caused by Alternaria solani, late blight by Phytopthora infestance, bacterial leaf spots, various fruit rots (Alternaria alternata, Geotrichum candidum, Aspergillus niger, A. flavus, Rhizopus stolonofer) were found pathogenic and their causes were isolated on artificial medium for varietal screening programme. Tomato plants were also found to be infected with cucumber mosaic virus (CMV) and tomato leaf curl virus. One new disease Alternaria leaf blight by Alternaria alternata was also recorded. All the germplasm under study showed the varying responses to all the biotic factors. Among abiotic disorders sunscald, zippering, blossom end rot, catfacing were observed in varying degree of responses. More than 100 sesame genotypes were evaluated against sesame phyllody and leaf curl diseases in the field, out of which only six showed minor infection of phyllody where as five genotypes showed minor leaf curl disease and the remaining material was free from both diseases..